Scott Pilgrim vs. The World is a film adaptation of one of the most successful teen novels of all time. The story and film have gained an almost cult like following, and I had to see what all the fuse was about. The truth is, that this particular film represents everything that is wrong with our society and youth culture in general. Scott Pilgrim is the kind of guy who likes to label everyone and everything, but worse than that, he rants in circles, using constant innuendos, that only a fourteen year old would understand. The story isn't even that unique or special, as the film moves at lightning speed, which is slightly slower than the speed at which it's star, Michael Cera, delivers his lines. I really felt as though my head was spinning, with a mix of slang and new terminology, that simply didn't make any sense to me. As far as the story goes, it's just another modern love story, featuring a lovable loser in love, which was completely unbelievable. The reason is Michael Cera, who seemingly plays the exact same role in every film. He's this nerdy, uncomfortable guy, trying all these awkward ways to get girls to fall for him, and it never works, possibly because he is one of the most feminine and closeted actors out there today. 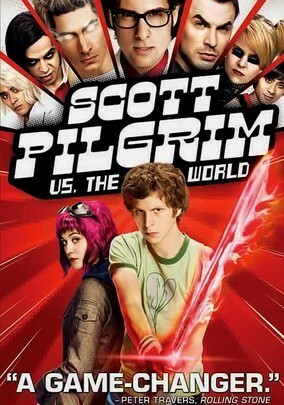 I generously gave this film 1 star, because I actually did enjoy Scott Pilgrim's band, but aside from that, this film is a complete waste of time. It's star is unbelievable, it's story is overly complicated, and the dialogue is arguably the worst I have ever heard. Scott Pilgrim vs. The World may be your teenage daughters favorite movie, but if you're older than sixteen, you're going to want to skip this one.